Publisher: Crescent Moon Press Inc.
Seventeen-year-old Alexia Stone never wanted to move cross country. And she certainly never wanted to share her new bedroom with an amnesiac ghost boy desperate for her help. 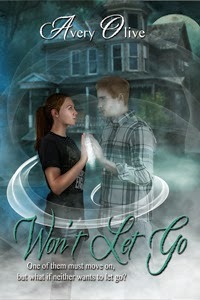 But after setting aside the assumption she’s gone crazy, Alexia engages in the impossible—she agrees to help the ghost discover who he was and what happened to him. Convinced this mystery is what’s keeping the phantom in the world of the living, Alexia puts her heart on the line to find out what his unfinished business might be. Ultimately, Alexia must decide what’s more important to her—keeping her phantom boyfriend or helping him finally find peace in death. What she didn’t plan on was not having a choice. One of them must move on, but what if neither wants to let go? What happens when you find the one that makes you happy and know you can never be with them? Ok so I just finished Won’t Let Go and I’m crying my eyes out. The endings of books are always the worst/best. And I swear there is going to be another one…..or am I the only one that got that vibe, if so I’m going to cry some more. Anyways now onto the actual story. Overall: A light and fun ghost story filled with lies, deceit, and romance. Alexia: I didn’t warm up to her right away. She was just waaaay to judgmental for my taste. She toned it down after a while though. I really commend her for helping Embry our, not many people would do that. They’d probably just call ghost busters…anybody…no, ok then. Lol By the end of the story I felt her pain. I just wanted to hug her. 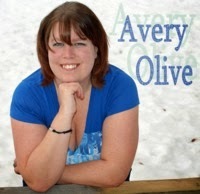 Avery Olive is Canadian. She is married and has one child. When she’s not helping raise her very energetic and inquisitive son, she can be found working on her latest novel--where she devilishly adds U’s into every word she can. When she is looking for a break Avery enjoys cake decorating, losing herself in a good book, or heading out to the lake to go camping. The release of Avery’s first novel proves to her it won’t be the last. As long as her family continues to be supportive, she can find the time, and people want to read, Avery vows to keep on writing. Thank you so much for being a part of the tour and posting a review!!! Release Day Party for Pan’s Conquest + Giveaway! Stacking the Shelves #47 It's been a month!!! !